In refugee situations around the world - from the one million Syrians who have fled their homes to the six million Congolese who've been displaced - there is one group that is particularly vulnerable: adolescent girls. Desperate families will often sell girls into forced marriages, and girls who have been orphaned or separated from their families are frequently the victims of sexual violence. "... if they don’t have protectors or parents, they are often sold off against their will." "Girls become commodities," Sasha Chanoff, founder and executive director of Refuge Point, told Here & Now. "So, particularly if they don't have protectors or parents, they are often sold off against their will." Many people have heard of the "Lost Boys of Sudan," the group of about 20,000 boys who fled violence in Sudan in the 1980s and '90s. Their families had either been killed or driven away, so these boys banded together and traveled across East Africa with no food, no water, and no way to defend themselves. Those who survived eventually walked 1,000 miles until they reached a refugee camp in Kenya. They lived in their own section of the camp and continued to watch out for each other while they waited years for a chance to resettle in another country. CBS's "60 Minutes" will air an in-depth special about the Lost Boys of Sudan this Sunday (details here). But the story of the Lost Boys raises a question: What happened to all the young girls who were caught in the violence in Sudan? Yar Ayuel, 28, was one of those girls. 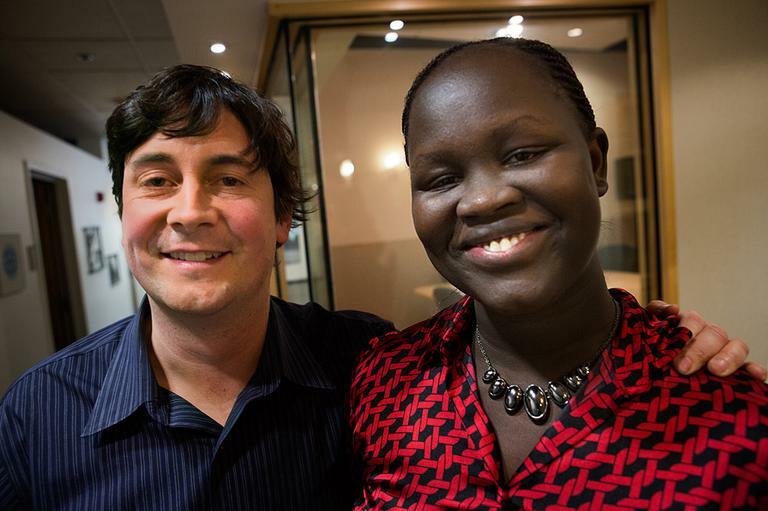 She fled Sudan as a child and lived in a refugee camps for seven years. She was one of just 89 girls who came to the United States, along with the 3,500 Lost Boys of Sudan. Today, she's getting her MBA at the University of Massachusetts Lowell and works at a nonprofit. She's also married and has a child. She saw what happened to girls at refugee camps who were orphaned or separated from their parents. She wants humanitarian agencies to make a special effort to watch out for refugee girls, everywhere in the world. "Find those girls, rather than listen to the community who says that, 'Oh, girls aren't lost. Girls don't have the same needs as boys,'" Ayuel told Here & Now. Yar Ayuel, a woman who fled Sudan as a child and lived in a refugee camps for seven years. Sasha Chanoff, founder and executive director of Refuge Point in Cambridge, Mass. This segment aired on March 29, 2013.